Claims that a new type of cat's eye, installed on a stretch of the A12 in Essex, could trigger epileptic fits, have prompted an investigation. 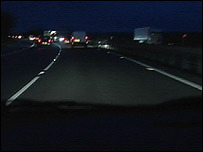 The Highways Agency has stopped installing the LEDs (light emitting diodes) until a review is completed. Normal cat's eyes reflect the light from headlights, but LEDs flash at about 100 times a second. Epileptic Rebecca Jasiczak says while travelling in a car on the A12 at Witham she narrowly avoided a seizure. Ms Jasiczak, of Chappel, Essex, said the solar-powered LEDs created a strobe-like effect which nearly triggered an epileptic fit. Her father Martin Jasiczak said: "I'm very concerned for my daughter's sake and for other drivers." The Highways Agency said it was taking the complaint seriously, no more LED cat's eyes will be installed until the effect on people with epilepsy had been fully evaluated. A spokesman said: "We are keen to investigate why this problem has occurred." He said the Highways Agency was looking at whether the lights needed to be spaced differently.